We currently have a limited supply of denim in the following colors - available sizes are limited. All Special Orders must be placed via phone or email. We also offer our Denim Chaps for Horseback Riding! If you're interested in our Denim Horseback Riding Chaps please Contact Us! We do not currently offer our Horseback Riding Chaps for sale online, but we would be happy to process your order personally over the phone. Waist sizes are adjustable up or down 6-8 inches. * Thigh measurement is important for proper fit! Denim Motorcycle Chaps - Order Now! All our Denim Motorcycle Chaps and Horseback Riding Chaps are Proudly Hand Made in USA. Our selection of quality denim chaps come in both Blue and Black. Choose from Buckle or Velcro front closure, and Snap or Velcro side closures. 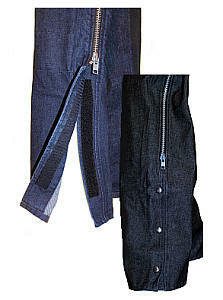 All our Denim Chaps have Unisex Styling, are made from top quality 100% cotton denim and use high-quality YKK Zippers. please Contact Us! We may have additional unlisted stock or we may be planning production in the near future. We will make every effort to get you exactly what you're looking for. Please Note: Although we make every effort to keep our denim colors consistent, there may be color variations between fabric lots. The colors pictured on this website are a general representation but are not exact. Ordering multiple products? Our checkout system is unable to process orders for multiple products in one transaction. If you'd like to order more than one item (different sizes, colors, etc.) please Contact Us to process your order manually. Cut straight down with room for below-the-knee boots. Buckle waist closures front and back. Velcro waist closures front and back. Lint Free, non-scratching 4" x 6" paper wipe. Safe to use on plastic. Packaged into a handy 2¼" x 3" sealed plastic & foil pouch. Evaporates quickly and clearly without needing a dry cloth. "On June 19, 2000, I was in a accident on my motorcycle. I was wearing a pair of your Denim Chaps that I had purchased at your stand during Biketoberfest in Daytona. 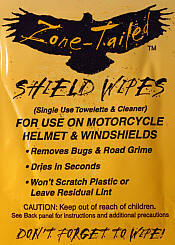 Although I received a broken leg and shoulder blade, your chaps saved me from a whole bunch of road rash. The Kevlar in the knees really did the job. Thank you for producing a quality product." "I received the chaps yesterday afternoon and they're perfect. Thanks so much for everything and hopefully, when our riding friends see how nice they are they'll order them. Have a nice weekend." "Hi...just got the chaps delivered....VERY NICE!! Thanks for the great service."